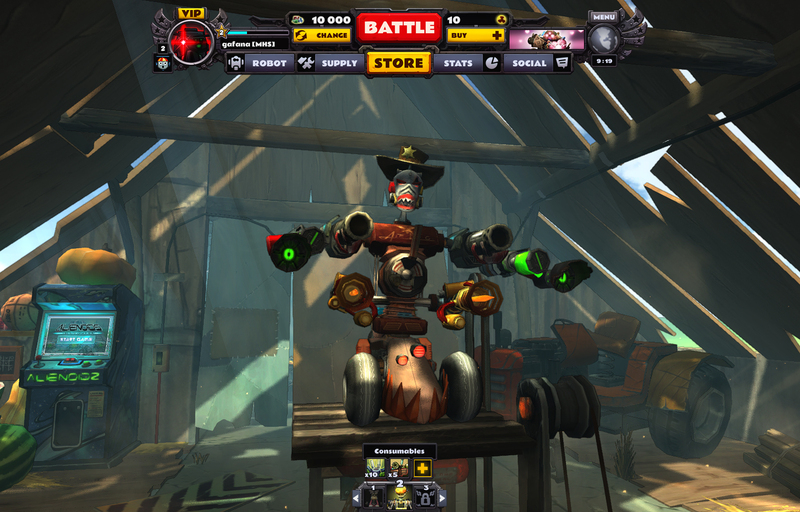 Guns and Robots brings robot action with massive customization. 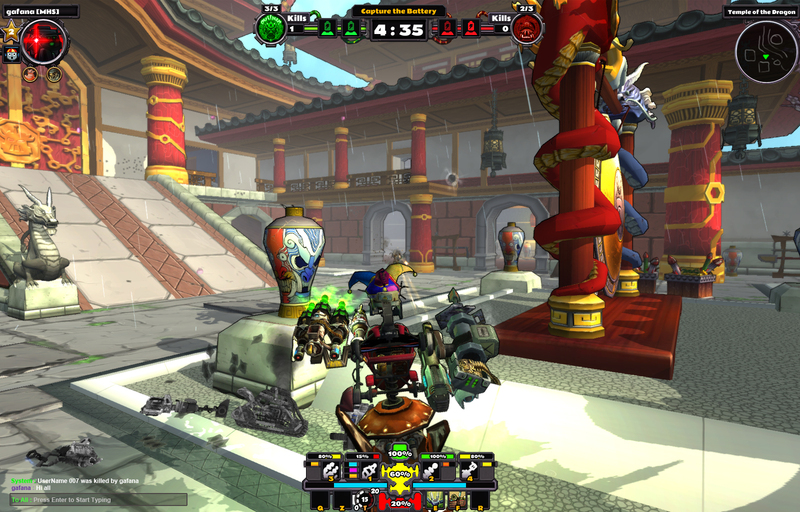 Players get cartoony bright 3D graphics in attractive environments and challenge each other in open arenas. Guns and Robots gives fun, entertaining experience with easy to master gameplay and numerous options to experiment robot constructing skills. The team behind Guns and Robots is proud to announce that the game is going through complete makeover that will take place in June this year. With easier to navigate and more user friendly interface, the new patch will bring significant improvements to the robot construction, the battles and will introduce a new system for upgrading items. The team behind Guns and Robots is proud to announce that their free-to-play shooter is going through complete makeover that will take place in June this year. With easier to navigate and more user friendly interface, the new patch will bring significant improvements to the robot construction, the battles and will introduce a new system for upgrading items. All players will enjoy extremely reduced prices of all items and weapons in the store. This will allow players to build and enhance the robot of their liking and to try out all parts and weapons from the very start of the game with option to upgrade them at later stages. Major update that the free to play shooter will introduce is a total interface redesign. The redesign will ease construction of robots and navigation through all menus. It will introduce players to new social panel, new dialogs with information about statistics and overall player performance, new sections for item upgrades, new customization features, new notification system. Players will now find it easier to navigate through the game interface thanks to the significant improvements.In battle, a new notification system will help walk players through the main objectives depending on the game mode, showing current states of the robots, details on the ammo and weaponry. Upon battle completion—detailed end-game dialogs will show players' performance with information for the credits won, bonuses acquired such as charges, consumables and crates. Big changes are coming to the robot construction process as well. This update will make customizing robots a lot more fun and easy to do. Fans of the cartoon-style shooter can expect to be given a lot of new ways to customize even more. They will have options to compare items, paint their robots along with easier and faster construction process. Parts comparison will help players pick the best fitting part with relative ease. Players will be shown options to pick parts with detailed statistics information and comparison dialog. The robot creation process will be supported with completely redesigned repair and resupply system for players to monitor. They will be able to check all their available parts that need attention. Robot painting will increase the customization of the robots with up to three available colors per part. Players will have the option to choose from rich palette of available starter pack colors to paint their robots according to their liking. The available options for players to pick will be whether to color a specific part, a module or the whole robot. their arsenal. Upgrading will be unlocked by acquiring the needed Tech Tree Level. After unlocking this level, an item will be available for upgrading. After battle, along with the standard prizes, there will be a new set of exciting bonuses for players to gather. Upon battle completion, players will now have the chance to get their hands on crates, that will give items, currency and consumables. The crates will be given at random to players for an opportunity to get epic rewards and get their hand on unique, non-purchasable items. Consumable types will be expanded with new ammo options, such as charges that will give tactical advantage in the game, as well as shield, speed and fire power. After the team gathered feedback from players, there will be an improved system for leveling up and enhanced experience with major rebalance. Premium accounts will also be added to the game. From next month players of Guns and Robots will have the option to get premium accounts with numerous perks. Jump straight into the action at Play-gar.com! I agree, But i think that might be somewhat of the case as you can adjust to it pretty quickly... Or at-least I can but im not sure if others have trouble...? Agreed, the ui should be similar to the color pallet used in the game. Thank you guys for your comments and feedback. If you would like to share your thoughts about other features and help make the game better, you can do that by participating in our Survey at Play-gar.com .